In case you missed it — here's a wrap-up of news from the Unidata Program Center for the month of December, 2012. Version 4.3.14 of the THREDDS Data Server (TDS), was made available 5 December 2012. Visualization is an increasingly important activity for understanding complex geoscience data, and for communicating results to a variety of audiences. As a result, the European Geoscience Union (EGU) conference has, in recent years, begun holding sessions dedicated to scientific visualization. For the 2013 EGU conference, to be held in Vienna, Austria from 7-12 April, 2013, this offering is being expanded into a full sub-programme titled Visualization for scientific discovery and communication. The abstract submission deadline for the conference is January 9th, 2013. Scientific data formats such as NetCDF have made great strides in areas like interoperability, scalability, and data compression. By comparison, methods for representing the uncertainty inherent in the values stored in scientific data sets are less robust. A group organized by researchers from the National Research Council of Italy's Institute for Atmospheric Pollution Research is trying to address this issue by creating a set of conventions for the representation of uncertainty values associated with data stored in NetCDF files. McIDAS-X Addendum v2009m aka v2012.2 has been released to make changes to the Unidata McIDAS-X/-XCD 2009 distribution. A new stable release of the NetCDF-Java/Common Data Model (CDM) library and the THREDDS Data Server (TDS), version 4.3.15, is now available on the NetCDF Java Library download page and the THREDDS Data Server page. We recommend that you upgrade to the current stable version as soon as possible in all cases. 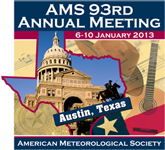 Members of the Unidata Program Center staff will be attending the 93nd annual American Meteorology Society meeting, January 6-10 2013, in Austin, Texas. Unidata will be in Booth 524 in the exhibit hall; feel free to stop by to talk with us. The booth will feature live, hands-on demonstrations of Unidata software and services, including a look at the current state of the AWIPS II environment. Come and talk with the developers about what's coming up and what you'd like to see. Version 6.11.2 of the LDM has been released.